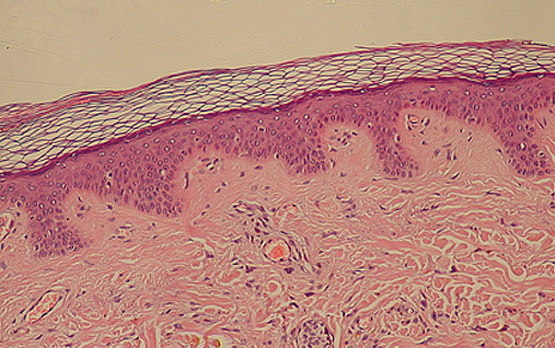 A stained cross-sectional slide, magnified 10 times, of human epidermal and dermal skin layers, both normal. Psoriasis is an autoimmune disorder in which skin cells proliferate out of control. For some hard-to-heal wounds, the problem is just the opposite: Restorative skin cells don’t grow well or fast enough. In a paper published in the June 21, 2012 issue of Immunity, researchers at the University of California, San Diego School of Medicine describe a molecule that may lead to new treatments for both problems. An international team of scientists led by principal investigator Richard L. Gallo, MD, PhD, professor of medicine and chief of UC San Diego’s Division of Dermatology, and first author Yuping Lai, PhD, professor of microbiology and immunity at East China Normal University in Shanghai, analyzed skin biopsies of patients with and without psoriasis, as well as the skin of mice with psoriasis and with wounds on their backs. They discovered that a molecule called regenerating islet-derived protein 3-alpha (REG3A) is highly expressed in skin cells during psoriasis and wound-healing, but not under normal skin conditions. In tests on mice, researchers found that inhibiting REG3A slowed wound-healing but cleared up psoriasis, which is commonly characterized by patches of inflammation and white, scaly skin. The scientists also noted that REG3A acts in concert with interleukin-17 (IL-17), an immune system protein involved in the signaling cascade which prompts skin cells to multiply in excess numbers. “IL-17 binds to receptors on skin cells and causes REG3A to be expressed, which then binds to another protein inside the cells that promotes cell growth,” said Lai. Gallo said the discovery of REG3A’s dual roles provides a new target for different therapies. Co-authors are Dongqing Li, Changwei Li, Ziwei Jiang, Zhiheng Li, Hu Lei, Yanchun Quan and Tian Zhang, all at the Shanghai Key Laboratory of Regulatory Biology, Institute of Biomedical Sciences and School of Life Sciences, East China Normal University; Beda Muhleisen, Paul Kotol and Tissa R. Hata, Division of Dermatology, Departments of Medicine and Pediatrics, UC San Diego; Katherine A. Radek, Department of Surgery, Burn and Shock Trauma Institute, Loyola University, Chicago; Hyun Jeong Park, Department of Dermatology, College of Medicine, The Catholic University of Korea, Seoul; Shin Morizane and Keiji Iwatsuki, Department of Dermatology, Okayama University Graduate School of Medicine, Dentistry and Pharmaceutical Sciences, Japan; Ge Tang, Center for Experimental Medicine and Systems Biology, Institute of Medical Science, University of Tokyo. Funding for this research came, in part, from the National Institutes of Health (grants AR052728, AI052453, AI083358), the National Natural Science Foundation of China and the Science and Technology Commission of Shanghai Municipality.